Hook standing at a crossroads where two historic coaching roads intersected has long provided a retreat for the weary traveler. There are five hotels in Hook. The Raven and White hart are vibrant country inns in the heart of the village offering roaring log fires and oak paneled interiors. Hook House Hotel is an elegant country house on the outskirts of the village. Tylney Hall and the Basingstoke Country Hotel are both outside of the village and offer a unique spa experience in the in the Hampshire Countryside. Hook is ideally situated for the traveller as junction 5 of the M3 is only a mile away and has its own railway station with direct trains to London Waterloo, Farnborough Woking and Basingstoke. 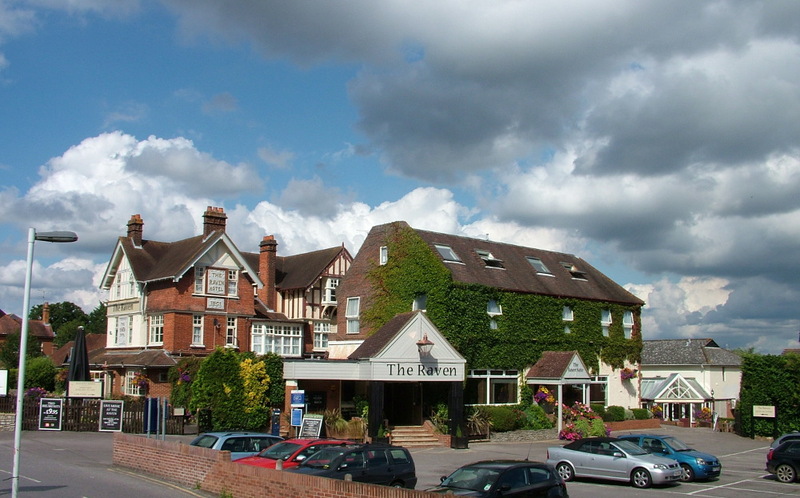 Situated a stone’s throw from the mainline station the Raven hotel, which dates from 1901, provides ideal accommodation for the business traveller or tourist. With a bar serving a large selection of wines, lagers and cask ales, restaurant and two function rooms the Raven is a popular venue for Weddings and business meetings. 270 ft. Walking time 1 Minute. Basingstoke Country Hotel is set off the A30 in a woodland setting. The Spindles gym and health spa offers the guest a heated inside pool and a choice of four treatment rooms. The hotel has three restaurants and bars and tranquil landscaped courtyards in a country setting. 1.2 Miles. Walking time 26 Minutes. Dating from the 18th Century this historic grade II listed coaching inn was formally known as the Bell and the Spread Eagle before settling on the White Hart. The hotel surrounds a courtyard, includes an ancient granary on straddles and a traditional oak beamed pub which is the live and soul of this Hampshire village and offers traditional pub food washed down with a good selection of cask ales. Within five minutes’ walk from the Hook train station the White Hart is an ideal base for exploring nearby Hampshire towns on the London mainline such as historic Winchester. London Waterloo is less than an hour’s train journey away. Guests can expect a spacious room with a flat-screen television and a private bathroom with bath. 0.2 Miles. Walking time 5 Minutes. Hook House is a Georgian grade II listed building situated off the A30 amid landscaped lawns in a country setting. Suited to private functions and weddings, Hook House offers guests excellent customer service and unrivalled comfort. Hook House has a Licensed Bar and Lounge and is famed for the cooked breakfasts. 1 Mile. Walking time 19 Minutes. Tylney Hall is a grand Victorian Mansion with impressive gardens designed by Gertrude Jekyll. After being a private residence since the 18th Century the Hall was used as a hospital during the first world war. The hall became a school in 1948 until 1985 when Tylney Hall opened its gates as a luxury hotel. A grade II listed building the hotel is surrounded by its historic parks and gardens. Tylney Hall provides its guests with unparalleled luxury and a silver service breakfast. 2.5 Miles. Walking time 50 Minutes.